I remember when I did this. Yikes. Not to the recipe. Yikes to the fact that I made a mess of something as easy as salmon. I am usually Ms Perfect when it comes to cooking seafood. I don’t mean to brag but my years of living in Goa and watching my parents work with fish has made it (close to) effortless for me. Cooking fish well, I can do. Doing the fancy medium rare slices you see on TV or eat at fine dining places, I struggle with. That’s not to say I haven’t tried. I have been successful on a rare occasion or two but just as I began to celebrate, my dad walked in and decided it was not the way of our ancestors. There was no reichado masala. Just some salt, pepper and fancy pants garlic, cilantro and lime. I mean, who does that?! Those kinds of cooks hide away in 5-star hotels and Internet kitchens. If you do find out about them, your friend will find a bottle of hot sauce on the table. Then you know what comes next. If you leave your friend at home, the fish will probably be too bland and you’ll wish he (because I can only see my male friends abuse sauce bottles) was there. Over here in my new apartment home, this is my kitchen! Until I have to do dishes, I’m celebrating. Because of all good things cooking in our kitchen has done for me, I have yet to get over that earth-shattering, brain-melting, eyeball-spinning feeling of looking at the mess I’ve just made. But fish? I love fish. I had to make a connection before I lost you all. 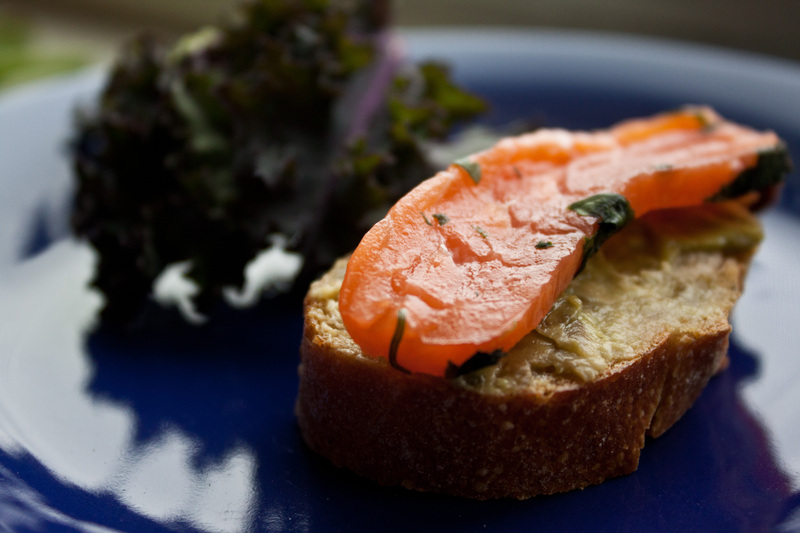 I have 2 salmon recipes for this week and I’ll share it in two parts so as not to confuse you further. One of them is cooked well but it’s just enough to keep that smooth texture I love about the fish so much. The other recipe, which I’m going to share today is a dream. It’s so easy to prepare for and the hardest part is waiting for it to get ready so it can get it yo belly! Oh the struggles of home-cooking. I found this recipe in Kim Severson and Glen Denkler’s The New Alaska Cookbook. It has plenty of seasonal recipes by chefs from restaurants and bakeries in Alaska and I am completely in love with it. If you love fresh seafood, this book is poetic. 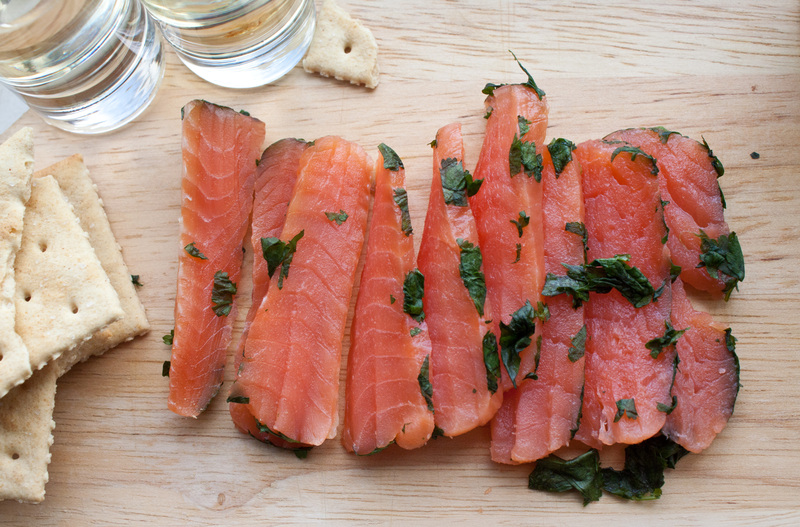 Unravel a piece of plastic wrap long enough to go around the salmon filet at least 2-3 times. 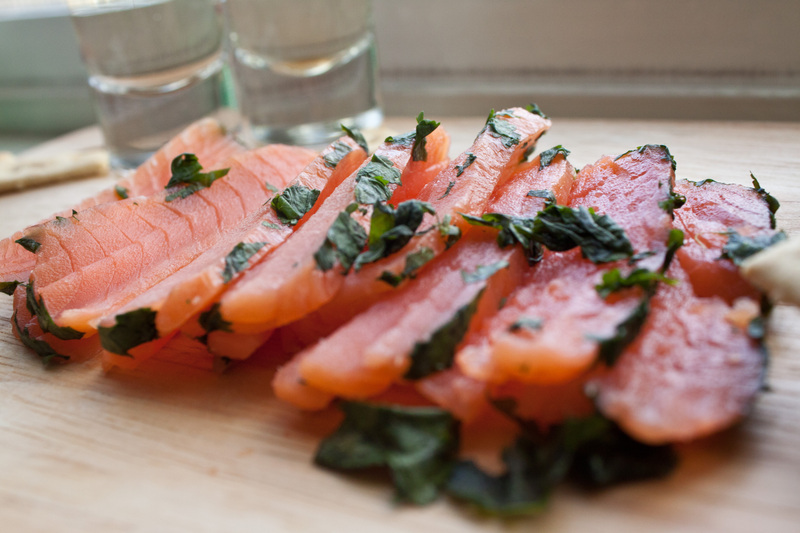 Place the salmon on the plastic wrap and sprinkle it with half the sugar and then half the salt. Spread it well using your hands. Not feet. Put half of the cilantro on the plastic wrap in the shape of the filet and place the coated side of the salmon on top of it. Put the rest of the sugar and then the salt on the other side of the salmon, coating it as you did before. Add the remaining cilantro on this side as well. Fold the plastic wrap over the top and roll it until the plastic wrap reaches the end. I tied mine with a rubber band just because sometimes I feel like plastic wrap is going to give up of me and go on strike. If you’re not eccentric, don’t you bother your tail feathers about it. Place the filet package into a shallow pan (or baking tray) and put some heavy weights on it. The water from the salmon needs to be squeeeeezed out over the 3-4 day period it stays in the fridge. I used cans of stuff I found in the kitchen cupboards to achieve this but be as innovative as you can. I placed the salmon in the fridge and left it there for 4 days (96 hours). You can also leave it in for 2 or 3 days but since it was my first time, I stuck with 4. Remove the excess sugary-salty liquid that collect at the bottom of the pan as and when you notice it (trust me, you WILL notice it!). Four days later, unwrap the salmon and slice it thin. Arrange it on a plate with crackers or eat it on a sliced baguette with avocado spread on top (of the bread…just in case I wasn’t clear). I think I can forgive myself now.